I am in "The Pit". If you are a deadbabymama unfortunately you know exactly what I am talking about. For those of you that don't I have included the poem that explains "The Pit". To be honest I had been feeling really good. I went off all of my prescriptions and have been instead working with a nutritionist. Overall I am feeling much better, I was even able to sleep the past week without taking anything and even woke up and wasn't groggy or tired. Until today...until tonight. I have been crying on and off most of the day. I guess I was feeling a bit too good, so now the crash into "The Pit". It also didn't help I was cleaning out the purse I was using when I lost Logan. The reason it didn't help is that there were all sorts of reminders of my last few days with my baby boy. I found the discharge papers for the NST I had just 4 days before his passing, the baby shower invite and chocolate I had received at a fellow deadbabymamas rainbow baby shower, and all of Logan's ultrasound pictures from early on right up to the last one at 31 wks. I would say I was on the edge of "The Pit" and that just gave me that last push, down at the bottom I find myself. Its almost 12:30am and I am wide awake, cant sleep, cant turn my mind off. So I am here getting it all out, then hopefully I'll be able to get some sleep. I guess its a good thing I am only working tomorrow and then vacay for the rest of the week. I think I am going to attempt to organize the nursery while I am off. I say attempt b/c it really hasn't been touched since the days leading up to my loss. Everything that was in any other part of the house has been tossed in there and well its kinda of a disarray. I keep putting it off, put feel like it's time. The day my child died, I fell into the pit of grief. My friends watched me struggle through daily life, waiting for the person I once was to arise from the pit, not realizing "she" is gone forever. The pit is full of darkness, heartache and despair, it paralyzes your thoughts, movements and ability to ration. The pit leaves you forever changed, unable to surface the person you once were. Some of my pre-grief friends gather around the top of the pit, waiting for the old me to appear before their eyes, not understanding what's taking me so long to emerge. After all, in their eyes, I've been in the pit for quite sometime. Yet in my eyes, it seems as if I fell in only yesterday. Not all of my pre-grief friends are gathered around the top of the pit. Some are helping me with the climb out of the darkness. They climb side by side with me from time to time, but mostly they climb ahead of me, waiting patiently at each plateau. Even with these friends I sometimes wonder if they are also waiting for the pre-grief me to magically appear before their eyes. Then there are the casual acquaintances, you know the ones who say, "Hi, how are you?" when they really don't care or really want to know. These are the people who sigh in relief, that it is my child who died and not theirs. You know...the "better them, than me" attitude. My post-grief friends (and a rare pre-grief friend) are the ones who climb with me, side by side, inch by inch, out of the pit with me. They are able to reassure me when I need reassurance, rest when I need resting, and encourage me to move forward when I don't have the strength. They have no expectations, no memories and no recollection of how I "should" be. They want me to get better, to smile more often and find joy in life, but they also accepted the person I've become. The "person" who is emerging from the pit. Its time I talk about a few things. I have a lot going on and I want to share. I have hesitated because of the reactions but this blog is mine and I want to be able to share anything. I was raised as a Jehovah's witness. But right before I turned 21, I decided to leave and move in with Tommy. I needed a break I guess. Because of the way in which I left my family including my parents stopped talking to me. Over the next few years I kept telling myself I didn't need them, or the things that I was raised with but it was always there in the back of my mind. When we lost Emma, so many of my family came to support us and it was nice to have them back but slowly as time passed I still didn't feel the need to go back. I still believed what I was raised with but again stayed away. My relationship with my parents and family eventually went back to the way it was. But the day that I found myself back in the same situation with knowing I was going to have to go through the pain of labor only to hold my stillborn son I didn't hesitate to call them to be there with us. They were there as quick as could be. And continued to be there for us. Each time I was with them they would encourage me come back to my roots, so to speak. I knew it was time but I kept putting it off. See it wasn't as simple as going back and everyone would greet me with open arms. Because of what I had done by leaving I have to prove myself and show how sorry I am for the mistakes I made. I know this may seem strange to many of you. But anyway with all the emotional things I was already going through I didn't think I could handle that as well. But one Sunday I just decided enough stalling it was time to go back. I wanted my babies to be proud of their mom. (See I had told myself that when Emma/Logan were born then I would go back b/c I wanted them to learn as well.) But when I lost Logan I realized that I still would want them to be proud of me and that I had no more excuses. It was time. So Sunday morning I got dressed and went. It was terrifying to walk back in there. Oh and I forgot to add that there are 3 babies (3 boys and 1 girl) that were born with days and weeks of Logan. So there was that too. But I managed to overcome all the fears and anxiety and went. When the first song started I began to cry. It felt so right. I had missed that feeling of purpose that it had given me. That was Sept 21 and I have continued to go. Sometimes it is very difficult, such as when a new baby boy came for the first time. Again it was a reminder of what should be. And the 4 little ones are now 3 months old. And there are times the sadness gets the best of me and I break down. But I know that it is helping me so much and its something else to focus on. It is still hard and things are still not back to normal but I am being patient and it is helping me to become a better person. And I know that when I do become pregnant again, it will help give me the peace of mind that I need when I get stressed out. It will help me be a better wife, mom and person in general. It has meant a lot of changes for Tommy and I as well, but I couldn't ask for a better and more supportive hubby. We definitely have different religious beliefs but he is completely supportive of me returning and even at times when I am frustrated and he doesn't understand all of it, he still gives me a hug and tells me it'll get better. How did I get such a great guy? I love him with everything! Ok well that is the update and this is one of the reasons I have been MIA. So thanks for reading and I'm glad I shared all of that. On a different note a fellow deadbabymamma lost again. 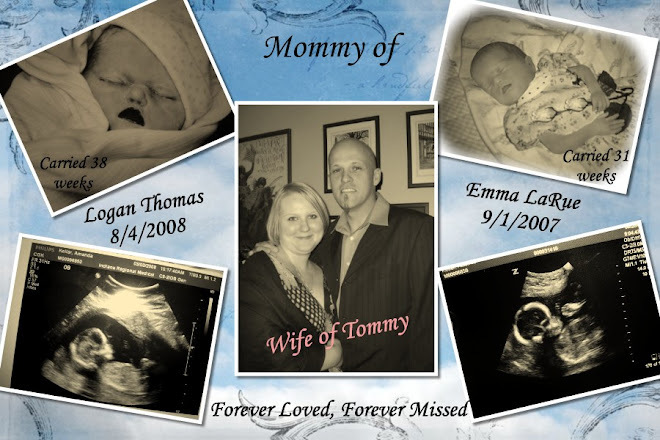 She was pregnant with twin baby girls and due to an incompetent cervix she lost them. I feel so bad for Jenelle and Rob. I know all too well what they are facing. Her blog felt as though the words were written by me. I just really hope that we both get our rainbow babies one day along with all my other mamma's that have loved and lost. (((HUGS))) to all of you!